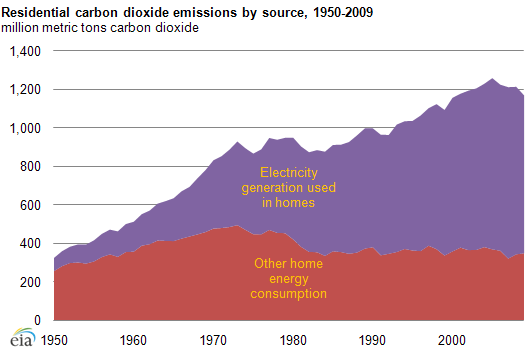 From 1950 to 2009, both the amount of carbon dioxide (CO2) emissions associated with residential use and the total amount of energy associated with households more than tripled. However, CO2 emissions associated with direct residential consumption of primary fuels (natural gas, heating oil, coal, etc.) increased very little, while CO2 emissions associated with the generation of electric power for household use, including electricity-related losses, increased twelve-fold. CO2 emissions from residential electricity use surpassed those from non-electric primary energy use in 1977, and in 2009 accounted for over 70% of energy-related residential CO2 emissions. Accounting for this increased CO2 share is the 19-fold growth in residential electricity consumption from 1950 to 2009. The greatly expanded use of power and the resulting associated emissions illustrates the importance of the relationship of power plant emissions and ultimate end-use. Please see EIA's Emissions of Greenhouse Gases in the U.S. for further details regarding CO2 emissions.